Techniquest has unveiled the latest in a series of new offerings as part of its strategy to refresh and renew its visitor experience. Ahead of the school summer holidays, the science discovery centre based in Cardiff Bay will be introducing three new interactive experiences. The educational charity has given a new lease of life to its ‘Animate It’ exhibit to bring it into the 21st century. Tying in with technological advances, the new look ‘Animate It’ gives visitors of all ages the opportunity to create their own animation, either from scratch or by customising a series of figures and scenes. Once complete, visitors can watch their creation via a 55-inch screen and through a number of different viewing platforms from history such as the Praxinoscope, as well as being able to email it to themselves to share via their social media channels. Through the school summer holidays, Techniquest will be trialling a web application to complement its hands-on interactive exhibits. Accessed through the centre’s free public Wi-Fi, the digital platform ‘Look Closer’ will allow visitors and its science communicators to delve deeper into the concepts behind a select number of exhibits, engaging further with STEM subjects (Science, Technology, Engineering and Maths). The third improvement being made is the introduction of a ‘human body hub’ featuring models of a brain mounted into a skull, a giant molar with dental cavities, an eye with eight removable parts including the iris, retina and lens, a heart, an occluded artery and arm with removable muscles. The human body hub will allow visitors to discover the structure of the different body parts and how they function. The latest installations follow the launch of a virtual reality changing room last month allowing visitors to get a virtual representation of themselves in a range of costumes including professions, fairytale creatures and animals. 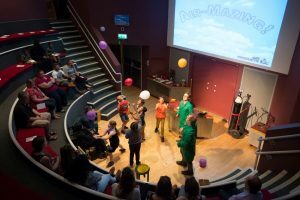 The developments are all part of Techniquest’s summer series, which includes BBC’s Terrific Scientific investigations, science demonstrations on the exhibition floor from Techniquest’s skilled staff and a new show for its Science Theatre. Sponsored by Air Products, Air-Mazing will delve deeper into what air is, what it contains and some of the amazing things that air can do. Lesley Kirkpatrick, CEO of Techniquest said: “We’re always looking for ways to enhance our visitor experience and extend our appeal to audiences of all ages and we have invested in our offering ahead of the school break to do just that. “Our new Animate It exhibit, Look Closer app and Human Body Hub will not only inspire and engage people in STEM, but will provide an engaging, memorable and innovative experience for those wanting a fun day out. Techniquest is an educational charity based in Cardiff Bay. Visiting its science discovery centre is a good value, educational day out for all ages, whatever the weather. It prides itself on inspiring audiences to engage with science, technology, engineering and maths. Techniquest is open every day throughout the summer holidays.